Ray Owens was born in Brownfield, Texas and grew up in west Texas, Oklahoma, and southeastern New Mexico. Ray passed away on Good Friday, 2007. God knows we all miss him! His wife, Verna, lives southeast of Artesia, NM , and has been blessed with two sons, three grandaughters, and three grandsons. Ray and Verna's family is tightly knit, and as warm as Ray. Verna has been blessed with support from the cowboy poetry crowd and her family. His interest in cowboy poetry went back as far as he could remember. When he was a young boy, he committed to memory such cowboy classics as "I'd Like to Be In Texas For The Round-Up In The Spring", "Cowboy Jack", and "The Yellow Rose of Texas"and sang them, mostly for his own amusement, ever since. Ray was a featured performer at several gatherings and events, and performed at dozens more. 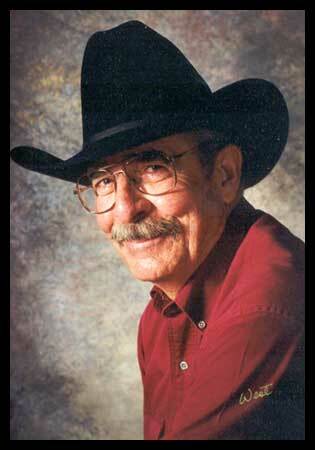 Within the genre, he is widely regarded as a talented cowboy poet. His poems speak of a first-hand knowledge of the West, yet reflect a personal and heartwarming pride in those things he holds dear.